DaimlerChrysler has forecast a slight increase in operating profit this year as earnings at its US business improve. 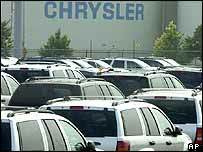 Chrysler, the company's US arm and maker of Jeep and Dodge vehicles, has lost money as it tries to lure buyers by offering discounts and incentives. That is set to change and the company expects profit growth to accelerate more quickly in 2005 and 2006. DaimlerChrysler is planning new Mercedes models and its truck business is showing further signs of recovery. The company said Chrysler had an operating loss of 506m euros (£340m; $643m) in 2003 from a profit of 609m a year earlier, mainly from the cost of incentives and restructuring. Profit at Mercedes, the main source of income, climbed to 3.1bn euros, while the truck business climbed out of the red to produce earnings of 855m euros. Even though the outlook is getting rosier, DaimlerChrysler said it still expects competition from rivals including BMW and Ford to be fierce. On Wednesday, the German government cancelled a contract to develop toll roads with a consortium formed by DaimlerChrysler, phone giant Deutsche Telekom and French company Cofiroute. It cited delays in implementing the toll system, which would use satellite technology. Germany also plans to take the company to court for compensation for lost toll revenue, the Associated Press reported.